Narrative forms of mental representation and their influence on comprehension, communication and judgment, have rapidly become one of the main foci of research and theory in not only psychology but also other disciplines, including linguistics, sociology, and anthropology. No one has been more responsible for the awakening of interest in this area than Roger Schank and Bob Abelson. In their target article, they argue that narrative forms of mental representation, or "stories," are the basic ingredients of social knowledge that play a fundamental role in the comprehension of information conveyed in a social context, the storage of this information in memory, and the later communication of it to others. After explicating the cognitive processes that underlie the construction of narratives and their use in comprehension, memory and communication, the chapter authors consider the influence of stories on a number of more specific phenomena, including political judgment, marital relations and memory distortions that underlie errors in eyewitness testimony. The provocativeness of the target chapter is matched by that of the companion articles, each of which not only provides an important commentary on Schank and Abelson's conceptualization, but also makes an important contribution to knowledge in its own right. The diversity of perspectives reflected in these articles, whose authors include researchers in linguistics, memory and comprehension, social inference, cognitive development, social judgment, close relationships, and social ecology, testifies to the breadth of theoretical and empirical issues to which the target chapter is potentially relevant. This volume is a timely and important contribution to research and theory not only in social cognition but in many other areas as well. "If one has an interest in how psychologists understand and use stories to reveal what people know and how they understand their own lives and the lives of others, this volume is a very useful source. In particular, the research programs and related literature detailed by the commentators are impressive for the range of topics studied through obtaining narrative accounts of participants." "…timely in its application, novel in its approach, and precise in its explication." Contents: R.C. Schank, R.P. 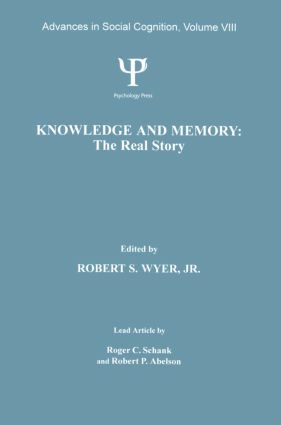 Abelson, Knowledge and Memory: The Real Story. J.H. Harvey, R. Martin, Celebrating the Story in Social Perception, Communication and Behavior. R.F. Baumeister, L.S. Newman, The Primacy of Stories, the Primacy of Roles, and the Polarizing Effects of Interpretive Motives: Some Propositions About Narratives. W.F. Brewer, To Assert That Essentially All Human Knowledge and Memory is Represented in Terms of Stories is Certainly Wrong. A.C. Graesser, V. Ottati, Why Stories? Some Evidence, Questions and Challenges. R. Hastie, N. Pennington, The Big Picture: Is It a Story? S.J. Read, L.C. Miller, Stories are Fundamental to Meaning and Memory: For Social Creatures, Could it be Otherwise? D.C. Rubin, Stories About Stories. L.M. Scott, Representation and Narrative: A Commentary on Schank and Abelson's "Knowledge and Memory." P.J. Miller, Personal Storytelling In Everyday Life: Social and Cultural Perspectives. K. Nelson, Stories in Memory: Developmental Issues. J.G. Holmes, S.L. Murray, Memory for Events in Close Relationships: Applying Schank and Abelson's Story Skeleton Model. E. Mankowski, J. Rappaport, Stories, Identity and the Psychological Sense of Community. R.P. Abelson, R.C. Schank, So All Knowledge isn't Stories?